The course enables students to sit the ITIL Capability examination in Release, Control & Validation.The ITIL Intermediate Qualification in Release, Control & Validation Certificate is a free-standing qualification, but is also part of the ITIL Intermediate Capability stream, and one of the modules that leads to the ITIL Expert in IT Service Management Certificate. 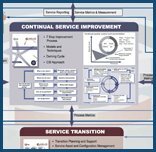 Students taking this course will improve role-based capability and competency by increasing understanding about terminology, processes, roles and functions, and activities in the ITIL Service Lifecycle. It also provides a structured guide to ensuring an organisation can develop and implement complete and integrated, best practice processes. The course enables students to sit the ITIL Capability examination in Release, Control & Validation.The ITIL Intermediate Qualification in Release, Control & Validation Certificate is a free-standing qualification, but is also part of the ITIL Intermediate Capability stream, and one of the modules that leads to the ITIL Expert in IT Service Management Certificate. ITIL Intermediate Qualification in Release, Control & Validation Certificate is intended to enable the holders of the certificate to apply the practices during the service management lifecycle. Operational staff involved in change management, release and deployment management, service validation and testing, service asset and configuration management, request fulfillment, change evaluation and knowledge management, who wish to enhance their role-based capabilities.